Clipboard style smartpad bridges the gap between handwriting and keyboarding, but clunky software tarnishes the results. 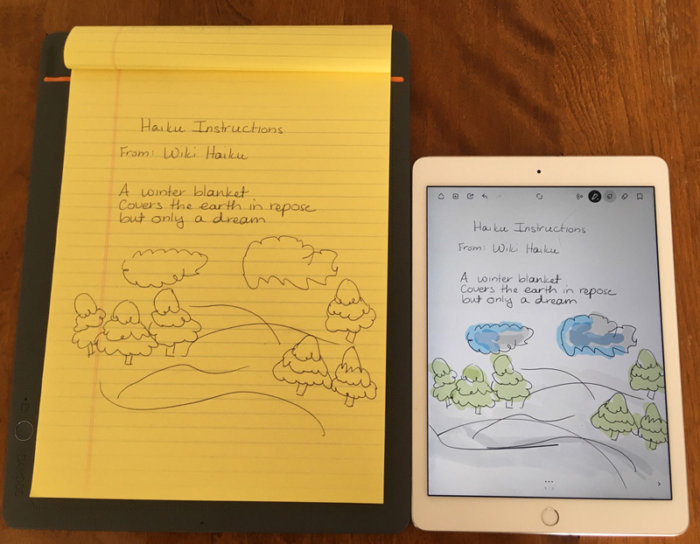 The concept is simple: If you like to take notes by hand—with pen and paper—and you’re not above a few diagrams and doodles along the way, Wacom’s Bamboo Slate ($130 and $150 on Amazon) smartpad might be the most optimal way to convert your notes from analog to digital. The Slate is an athletic-coach-style clipboard note-taker, while Bamboo Folio ($200 on Amazon), a concurrently released variation, works similarly albeit with a different form factor that features an integrated cover. Bamboo Slate’s companion pen, with its traditional ink tip that is not a stylus, lets you jot down notes, upload them to the cloud, and edit and share them in various formats from your iOS devices. Constructed of medium gray polyurethane on the front and matching nylon fabric on the back, Bamboo Slate’s larger letter format version (A4), at 10 x 12.9 inches, is hardly light or petite. Its blandly stylish appearance blends unobtrusively with other office tools or school supplies you may be toting around. At 1.6 pounds, comparable to an iPad Pro, it feels weighty. For those who prefer something more delicate, a half-letter size (A5) at 9.8 x 7.3 inches at is also available. I tested the larger version for this review. 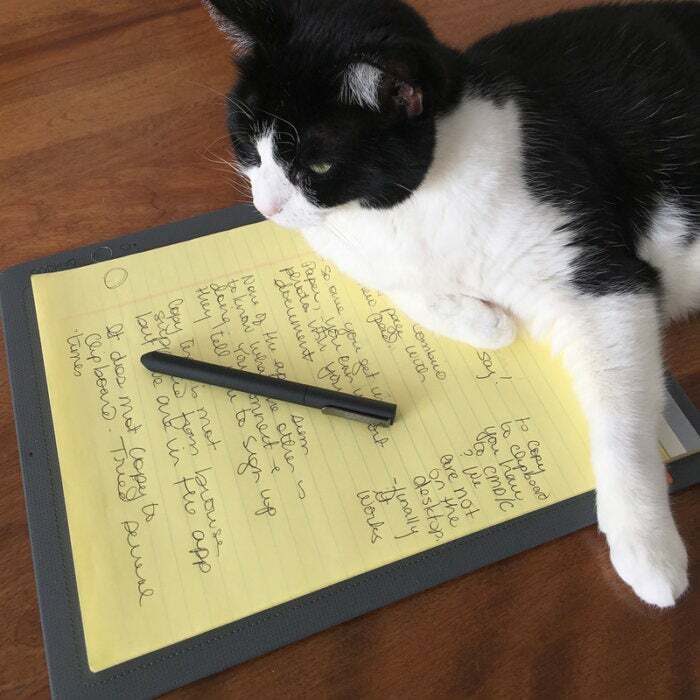 Large clipboard style smartpad lets you take lots of notes (cat not included). The Slate comes with a full pad of paper, but when you’re done with that you can easily use any pad you want. No special paper is needed. Any markings on the page can be instantly converted to digital format and uploaded via your iOS device with the press of a button. Slate makes digital transfer easy because this button is the only hardware control on the device. You can even store pages and sync them later. Battery life was fairly robust: The Slate can hold a single charge over several days of intermittent use, with juice to spare. The Wacom Pen is simple and quite nice. It looks like a regular ballpoint pen — the kind where you twist the end to expose the writing tip. I’m especially fond of the matte black finish, which makes for a pleasant grip. The clip is a good idea because you can attach it directly to the Slate so as not to lose track of it among your other pens. Ink cartridges can be replaced and an extra one comes in the box. The pen itself has 1,024 levels of pressure. 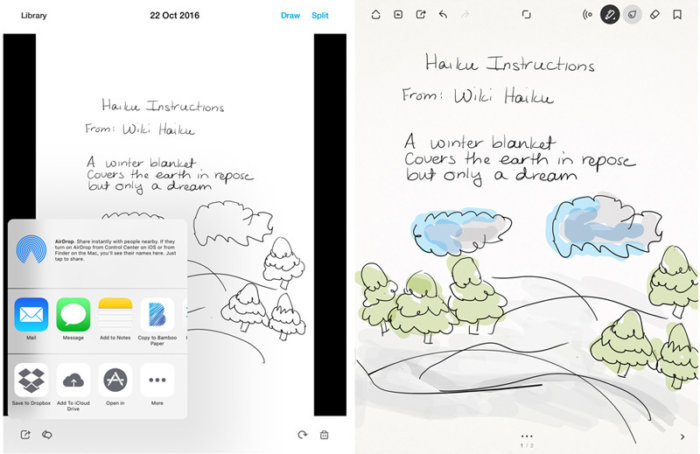 Wacom’s Inkspace app connects the Slate to your Bluetooth iOS or Android mobile devices, syncing your handwriting and drawings to re-use or share. 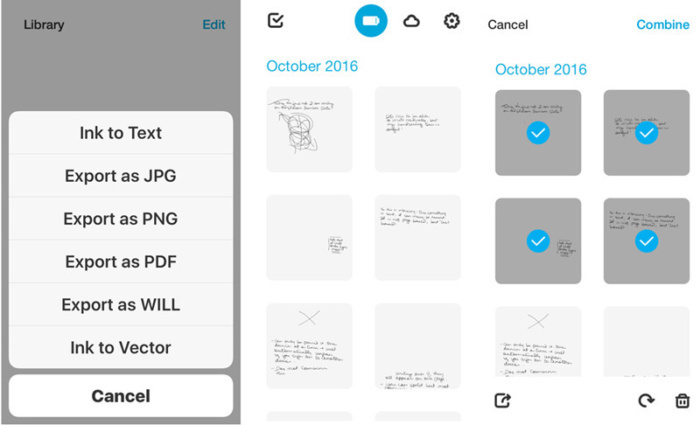 Inkspace lets you edit your notes and sketches, as well as combine or split pages of notes, and lets you draw on existing notes. You can export files in JPG, PNG, PDF, and WILL (Wacom Ink Layer Language) file formats directly to the Wacom cloud or other cloud services like Dropbox, Evernote, or OneNote. Each button press sends content to its own page, but you can combine or split pages. 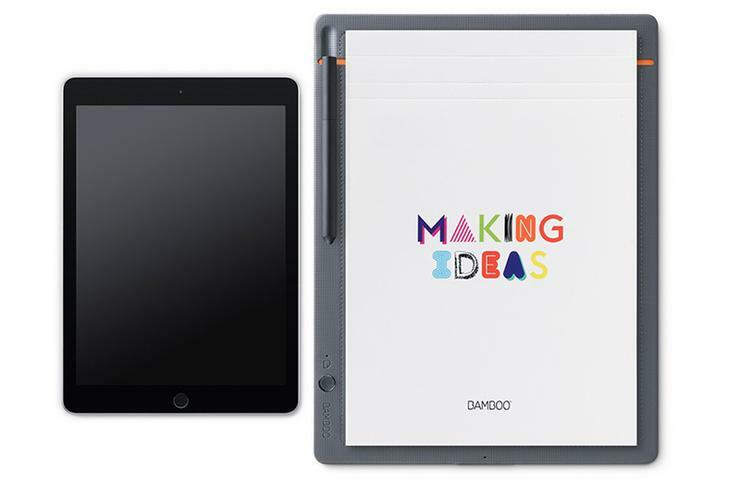 Bamboo Slate includes the free Inkspace Basic app, 5GB of storage on Wacom’s cloud for some 6,000 pages of notes, the ability to sync content across devices, and access to your content on the Inkspace web portal. The Basic app serves as a bare bones introduction to a more fully featured Inkspace Plus version, immediately available for a three-month free trial subscription. 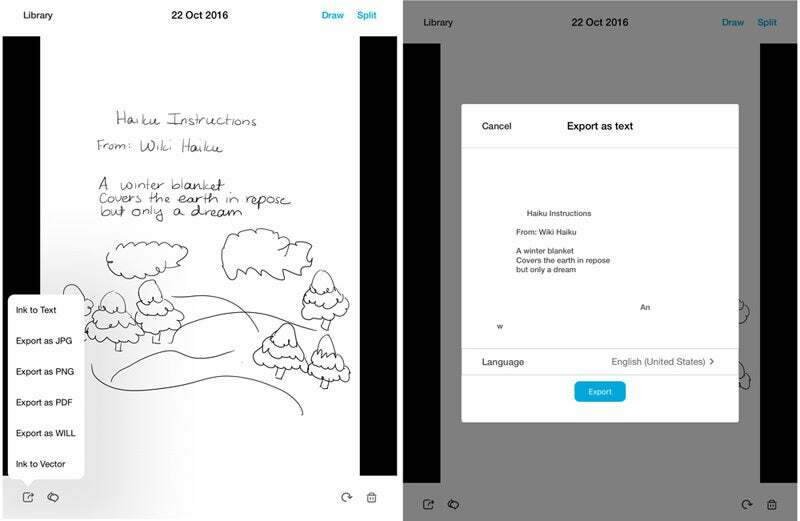 In addition to all features of Inkspace Basic, the Plus app offers enhancements like converting your handwriting to rich text, a search feature, export to scalable vector file format (SVG) for use in drawing programs, collaboration abilities, and 50GB of storage for some 60,000 pages of notes. 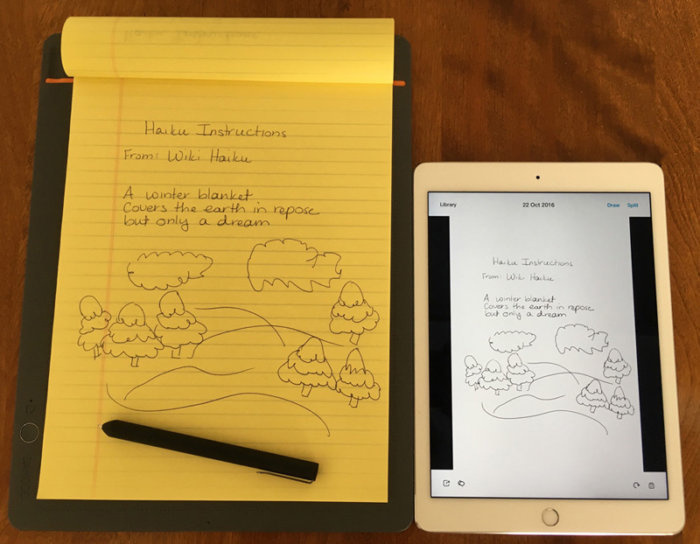 A live mode lets you watch the screen as you write or draw. I found those features worked quickly and as advertised. The downside is that for the useful features that make the hardware a good investment, the premium version of the app costs a pricey $3 per month after the trial ends. Access to both versions of the app also requires a Wacom ID. Despite the reliable hardware functionality, I found the software package to be the weakest and most frustrating aspect of the Slate experience: The Basic app is too limited, the Plus app is too expensive, and both are unintuitive. Coloring your note with Bamboo Paper. Getting started was a bit glitchy. The pairing procedure between the Slate and your mobile device must be performed accurately and in the exact sequence prescribed. You cannot pair multiple devices with the Slate at the same time, so in testing features on the iPad, I was automatically signed off the iPhone Inkspace app. To use the collaboration features, I had to sign in a second time on my device, even though I was already signed into the app and was syncing documents with it. Export to text was fairly accurate. Each text upload goes on its own page, so even if you continue writing on the same piece of paper, the last upload will only register content that had not been previously uploaded, rather than showing everything currently on the page. You can combine and split pages using Inkspace, however. Post-sync editing options are limited, too, and adding colors or highlights to your notes requires Bamboo Paper, a different Wacom app. Linking up your notes with Bamboo Paper—which is available only on the iPad—lets you add color and other elements like Photos to your output. 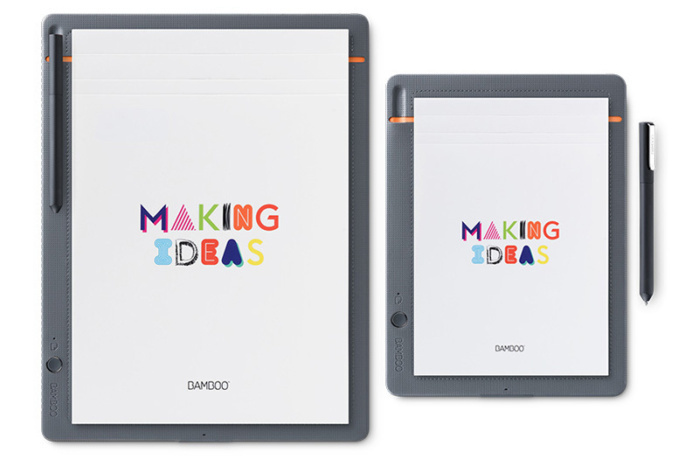 To use the Bamboo Paper app with your Bamboo Slate, you must first export your work as a WILL file and open it in Paper. Considering the process already involves using one app to sync files, adding another app to the mix feels clunky. Transferring your document to Bamboo Paper. 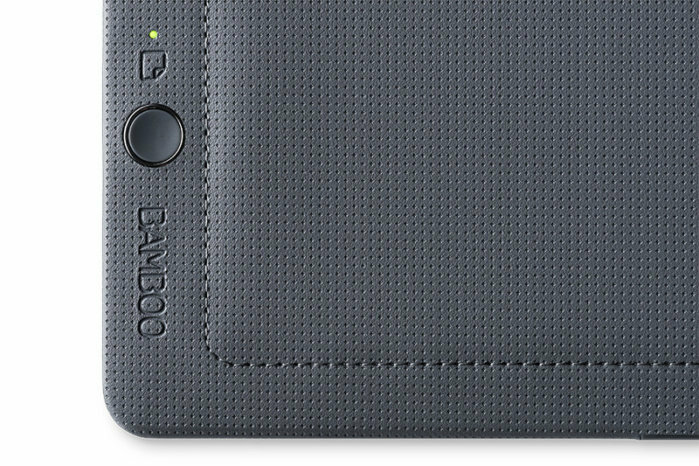 Wacom’s Bamboo Slate smartpad gives everyone from students to office workers the ability to seamlessly switch back and forth between handwritten note-taking and typing into a device, making notes potentially more effective and personal. Despite the admirable functionality of the Slate and Pen, the interaction between the hardware and the software felt awkward, especially separating out basic and premium versions, and then forcing a second app for color work and additional editing. The software component needs to be more elegant, streamlined, and intuitive. The free version should offer more features.